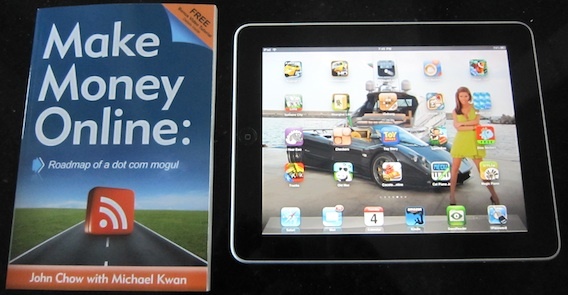 Michael Kwan and I are giving away not one but TWO Apple iPads as part of the promotion for our new book, Make Money Online: Roadmap of a Dot Com Mogul. That’s right. Just for picking up a copy of our new book, you can be rocking and rolling with Apple’s newest magical and revolutionary tablet. Here’s how to enter. I’ve created a photo gallery of readers who have purchased Money Online Online. If your picture is in the gallery, you’re entered to win a 16GB WiFi Apple iPad. To add your photo, simply take a picture with you and the book and email it to johnchow @ johnchow.com. If you have a blog, include your URL and I’ll link to it from the gallery. Not only will this get you entry for the big prize, but I’ll be profiling some reader photos in a future post so you might show up in this blog as well! Your chance of winning is based on the number of people who submit photos. Right now, there’s only three photos in the gallery so the chances are pretty damn good. Send in your entry today! The second 16GB WiFi iPad will be awarded to a reader who reviews Make Money Online. Review the book on your blog and send me the URL and you’ll in. Your review should be completely honest and unbiased. I won’t get mad or throw out your entry if you give me a bad review. I really want honest feedback. All reviews will be featured on this blog as the come in. Your odds of winning is based on the number of reviews received. Right now, there’s only two so the odds are really good! If you own more than one blog, you can review the book on any of them to earn extra entries. Here’s the first review by Jon Strocel. Jon did his as a video review. The second review came from Zen Editorial and I’m glad to read they found the book very well edited (I have Michael Kwan to thank for that). 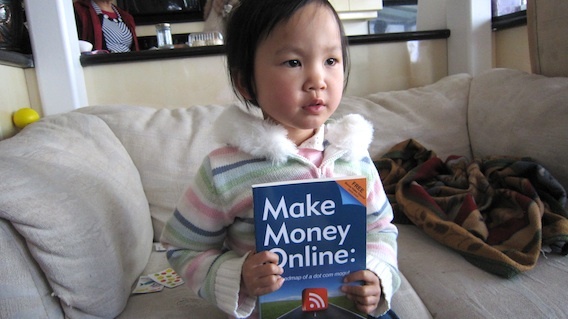 Make Money Online: Roadmap of a Dot Com Mogul is available direct from Amazon.com or any major book chain like Chapters or Barnes & Noble. Prices range from $10.85 plus shipping at Amazon.com to $19.99 at the Richmond Chapters bookstore. If you wish to have a signed copy, you can order it direct from me for $20 plus $3.99 flat world wide shipping. Please include your name and shipping address plus any special dedication you want me to sign onto the book. Deadline for entries for both contests end of this month. Good luck and I look forward to seeing the photos and reviews!